» home » magazine » 2011 » december 2011 » are laboratory forming tests worthwhile? Are Laboratory Forming Tests Worthwhile? Fig. 1—Measuring stretchability limits by the Olsen test often is comprised by the flow of binder material into the dome. The metalforming industry has many simulative test parts that laboratories use for predicting the formability of similar but much larger size configurations in actual stampings. Examples include Olsen stretch, limiting dome height, 4-in.-dia. hemispherical dome, Swift cup, Fukui conical, hole expansion, hydraulic bulge, Erichsen stretch and numerous bending operations. Historically, these tests have been used more in Europe and Asia than in North America. With the current intermingling of global industries, all groups using these tests should be aware of their deficiencies; the following discussion should generate great concern about the ability of lab tests to predict the performance of full-size stampings. The values of these parameters in laboratory tests and during production stamping usually differ by several magnitudes. Even worse, many laboratory tests are improperly conducted, as noted below. Olsen test: This test evaluates sheetmetal stretchability. A strip of material is locked over a 1-in.-dia. hemispherical punch (Fig. 1). As the punch moves upward, the material is subjected to biaxial stretch until the dome tears and the maximum height at failure recorded. Manual tests have a range of failure heights for a single sample depending on the ability of the operator to stop the test exactly at the onset of failure; automatic test machines may use maximum load detection as the onset of failure. The strip then moves along the die set until clearance is obtained to run another dome. This sequence continues until five domes have been formed and an average of the five heights computed and recorded as the measure of stretchability. Unfortunately, other variables often influence failure height. For example, the test strip in Fig. 1 shows the binder feeding sheetmetal into the dome from two sides, due to improper binder locking. This means the cross-strip direction is a combination of stretch and draw, not pure stretching required by the test. Fig. 2—Edge stretchability limits during the hole-expansion test are more dependent on the quality of the cut edge of the hole than the sheetmetal. The lubricant applied to the sheetmetal affects stretch distribution and failure height. Even a constant lubricant type and quantity applied when the material is tested will not provide a correct test. Ford Motor Co.’s Norbert Izworsky studied the coefficient of friction when two different lubricants were both applied to the same sample. He found that the lubricant first applied to the sheetmetal fills the valleys in the surface topography, and the second lubricant applied on top simply is pushed out of the deformation zone by the die segments. The coefficient of friction controlling material flow is that of the first lubricant—high-coefficient-friction slushing oil intended only for rust prevention or an excellent lubricant that also prevents rust formation. For meaningful tests, all lubricant should be removed from the test strip and replaced by a constant test lubricant. Attempts to form parts dry create high variability and often galling. Testing galvannealed samples are especially difficult. This zinc-iron-alloy coating is like coral—once a lubricant enters the very hard porous structure, it proves extremely difficult to remove. Hole expansion test: This simple test (Fig. 2) begins by creating a hole in the center of a square blank, placed on a die and clamped by the blank holder. A punch (typically conical, but hemispherical and flat punches also find use) expands the hole until the edges of the blank begin to crack. Edge stretchability (percent hole expansion) is determined by averaging the increase in hole diameters around the circle. However, test accuracy will vary with the edge quality of the hole. If a punch is used, severe cold working of the surrounding material significantly reduces the amount of residual edge stretch. A study conducted by Inland Steel’s R.R. Hilson, presented at Microalloying 75, showed a reduction of hole expansion from 280 percent for a milled hole (almost no damage) to 80 percent for a good-quality punched hole with 10-percent clearance on each side. Other studies have confirmed these dramatic reductions and also have documented even lower hole-expansion percentages as the punch wears. Fig. 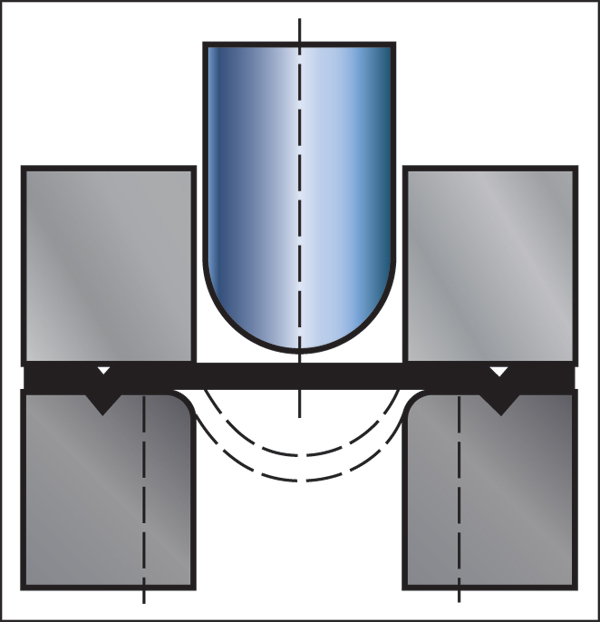 3—Sheetmetal stretchability measured by the limiting dome height test depends on the properties of the sheetmetal and the lubricant on the sheet surface. Limiting dome height test: Another sheetmetal-stretchability test uses a 4-in.-dia. hemispherical punch to deform a 10- by 5-in. blank (Fig. 3). Blank width is set for no deformation in the width direction (plane strain—a state of minimum stretchability according to the forming-limit curve). A specification states the minimum height of the hemisphere at failure; one common height was 1.33 in. Long-term evaluation showed that this test was subject to great variation in stretchability for any given batch of sheetmetal. The minimum 1.33 value could be achieved by either excellent stretchability and a poor lubricant; average stretchability and an average lubricant; poor stretchability and an excellent lubricant; or any combination within that range. Sheetmetal stretchability was not defined. Any laboratory that has a four-inch diameter hemispherical punch test device can make true LDH tests. Prof. Taylan Altan at Ohio State University in Columbus has the equipment and runs many different dome tests. Do you know of a facility that tests Limiting Dome Height ?